Also serving communities of Morton. There are 6 Assisted Living Facilities in the Yelm area, with 2 in Yelm and 4 nearby. The average cost of assisted living in Yelm is $2,655 per month. This is lower than the national median of $3,346. To help you with your search, browse the 28 reviews below for assisted living facilities in Yelm. On average, consumers rate assisted living in Yelm 4.5 out of 5 stars. Better rated regions include Milton with an average rating of 4.9 out of 5 stars. Caring.com has helped thousands of families find high-quality senior care. To speak with one of our Family Advisors about assisted living options and costs in Yelm, call (855) 863-8283. Yelm, Washington, is just over an hour’s drive away from the Pacific Ocean which is perfect for seniors who enjoy wildlife watching tours and boating activities. Seniors can choose from 17 Assisted Living Facilities (ALFs), in the area, all of which provide room and board to seniors as well as offering meal services, personal care and 24-hour supervision. ALFs are licensed by the Washington State Department of Social and Health Services (DSHS), Aging and Long-Term Support Administration department. Yelm’s climate has a July average high of 76 degrees Fahrenheit and a January average low temperature of 34 degrees. Although the winter is chilly, it only gets six inches of snow, so seniors with limited mobility can still remain active all year round. Seniors thinking about living in Yelm might feel concerned about the city’s high property crime rate. Violent crime is rated at 16.5 out of 100 (1 being the safest), which is lower than the national average of 31.1. Property crime is rated at 51.8, which is much higher than the national average of 38.1. Yelm has no facilities from which to choose in the event of a medical emergency or illness, with the nearest major hospital, MultiCare Allenmore Hospital, located in Tacoma. Seniors in Yelm have access to Inner City Transit services, which is available to transport them to and from doctor appointments, shopping venues and visits to local attractions. There is a reduced fare for seniors. The American Lung Association has rated Thurston County with an ozone score of "A," which means that the air quality is safe even for seniors with respiratory illnesses. Seniors looking to spot wildlife can go to the Northwest Trek Wildlife Park where they can take a tram tour and learn about the animals' natural habitats. Seniors can also dig into Yelm's rich history by visiting the Yelm Historical Museum. Assisted Living costs in Yelm start around $2,655 per month on average, while the nationwide average cost of assisted living is $4,000 per month, according to the latest figures from Genworth’s Cost of Care Survey. It’s important to note that assisted living rates in Yelm and the surrounding suburbs can vary widely based on factors such as location, the level of care needed, apartment size and the types of amenities offered at each community. 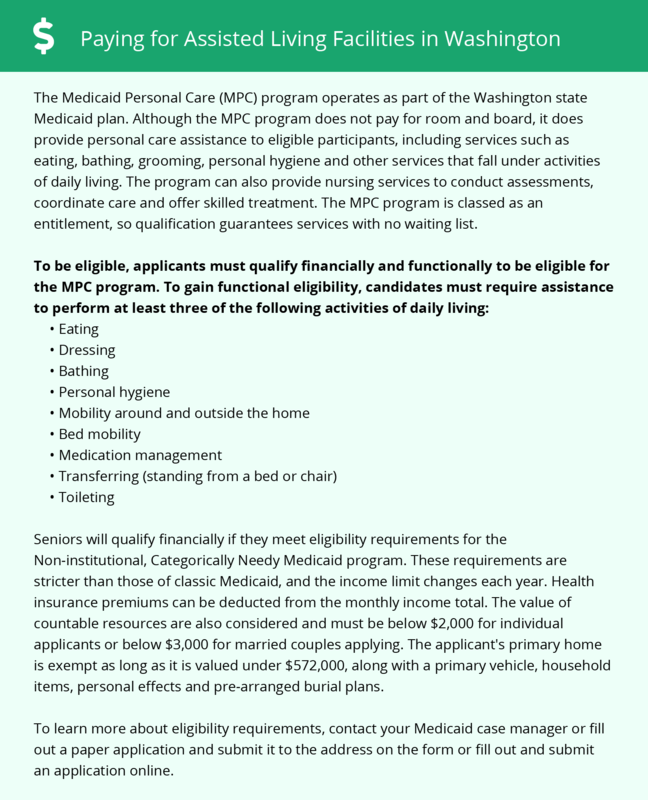 Seniors with limited income in Washington may be able to get help paying for assisted living costs through the Medicaid Personal Care (MPC) or Washington Medicaid COPES programs, both of which are provided by the state. Yelm and the surrounding area are home to numerous government agencies and non-profit organizations offering help for seniors searching for or currently residing in an assisted living community. These organizations can also provide assistance in a number of other eldercare services such as geriatric care management, elder law advice, estate planning, finding home care and health and wellness programs. To see a list of free assisted living resources in Yelm, please visit our Assisted Living in Washington page. Yelm-area assisted living communities must adhere to the comprehensive set of state laws and regulations that all assisted living communities in Washington are required to follow. Visit our Assisted Living in Washington page for more information about these laws.